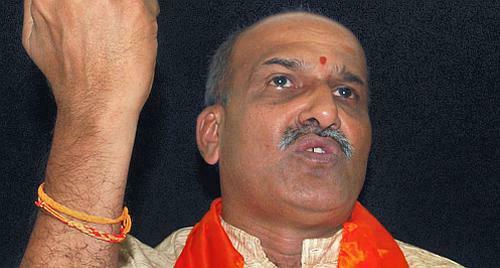 Pramod Muthalik: Villain, once again! The Pakistani flag was hoisted by right-wing extremist group Sri Ram Sene with the aim to put blame on local Muslims and create tension. This sensational disclosure was made after Karnataka police arrested six youths who were activists of Ram Sene, the militant group, which has been involved in several other cases of crimes in the past in the South Indian state. Police said that the main accused, Rakesh Math, and his accomplices, wanted to foment communal trouble in Bijapur. The flag was hoisted near tehsildar office in Sindagi. The Ram Sene (also known as Ram Sena) leaders have however said that its members were not involved in the incident. The district leadership said that all those arrested in the incident owed allegiance to the Rashtriya Swayamsevak Sangh (RSS). Sene chief Pramod Muthalik also said that his workers were not involved in the incident. Other sources suggest that a BJP leader was involved in the incident to stir religious passions. In the past also, pro-Hindutva elements have tried to mislead investigators either by leaving evidence near a madarsa or using fake beards and skullcaps, so as to pin blame on Muslims. Congress has demanded a CBI inquiry into the incident and has sought ban on Sri Ram Sene.